With the civil unrest of the past decade, many hundreds of children have been placed in orphanages. Of the over 13,000 orphans, only 1.5% are adopted. Those not adopted still need a great deal in order to thrive both while in the orphanages and after they leave at the age of 16. Moreover, the children in these 'children's homes' are subject to terrible conditions and especially vulnerable to abuse and exploitation. The following programs are at the heart of what we do to help the remaining population of abandoned children. 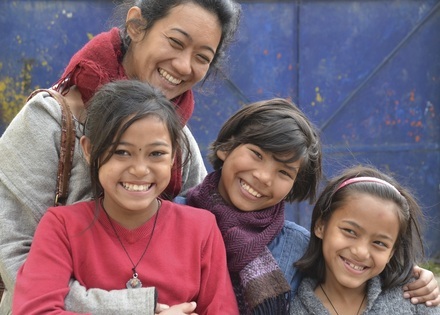 The Kumari Project Safe House offers long-term placement for 12 vulnerable and abandoned Nepalese children (ten girls and two of their little brothers). The Kumari Project works to add essential vitamins and minerals to the orphanage diet. This means supplementing rice and potatoes with greens, fruit, and protein. The Kumari Project has funded the education and educational materials – tuition, school supplies, test fees, school uniforms – of over 50 girls and boys. To further engage and develop children’s literacy, confidence, and passion for learning, we integrate art and writing into extracurricular activities led by The Kumari Project volunteers. "We must pay attention to (a child's) sense of inner value... children who are are lacking affections from their mothers or friends, have a sense of insecurity, fear, and distrust for the rest of their lives... We must provide maximum affection for our children."